This time I served it with rice but you could as well serve it with potato mash. The recipe multiplies easily. Season and fry the pork escalopes in a pan over medium heat until nicely golden and cooked through. Put to the side and keep warm. Put the leek slices into the pan and fry for 5 - 6 minutes. Add the wine and reduce by two thirds. Stir in the mustard, stock and cream. Season to taste. Let this bubble away for a couple of minutes. Add the basil and a good squeeze of lemon juice. 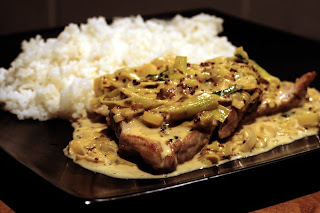 Serve the pork and sauce with rice. Adding some honey at the end of the cooking glazes the meatballs nicely. That combined with the Garam Masala gives it a slightly 'Middle Eastern' taste, something that's accentuated by the couscous. As I see it, this is a simple way of transforming your normal run-of-the-mill meatballs to something a little bit more exotic. As you can see from the picture I also oven roasted some homegrown tomatoes, taken from Solo's tomato plantation. If you want to jazz up the couscous a bit you can add some dried fruit to it. 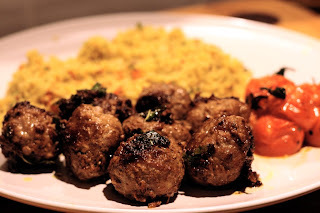 Tell you what, if you don't have the energy to make the meatballs from the ground up - why not grab a pack of ready-made ones from the supermarket? Frying them like this is going to make them taste much better. Make the meatballs according to the recipe. Fry the meatballs in butter with the Garam Masala for a couple of minutes. Pour on the honey and lemon juice. Finally stir in the torn basil leaves. Keep frying and stirring on a medium heat until nicely coloured. I was on call yesterday so I couldn't really head down to the super market to pick stuff up for my lunch. That meant having to try and use what I had in the cupboards and the fridge. Well, this is what I came up with. It turned out to be tasty and filling. What more could I ask for? Don't forget to heat the grill (broiler) so that it's ready towards the end of the cooking. Grated cheese, strong cheddar preferably. Heat the oil in a frying pan on low to medium heat. Once heated, add the mushrooms, onions and garlic and let this cook slowly. Season well. Once the mushrooms and onion are nice and soft, add the sausage. Let this cook until the sausage starts to crisp. Pour in the eggs and give it all a good stir. Let this cook away until the eggs starts to set properly. Scatter the cheese on top of the omelet and shove the pan under your grill until the cheese starts to go nice and golden. Plate, scatter some fresh parsley on top. This is what I cooked yesterday evening, Friday night, after a long week at work. I wasn't really in the mood for a lengthy session with lots of involvement in the kitchen so this worked quite nicely. A bit of cutting, slicing and grating. Then off into the oven. From the oven onto the plate. Doesn't get much better or easier than that at times. Oh yeah, don't forget the chef oil either. This time I decided to use a nice bottle of 2006 Madiran Reserve Des Tuguets to keep myself lubricated. A wine and vintage I can thoroughly recommend. 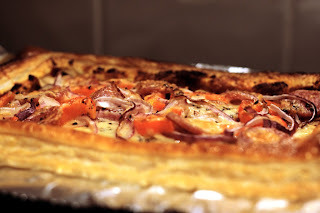 Don't forget to give yourself about an hour and a halfs time to let the puff pastry defrost if you are using the frozen variety. I used Jus-Rol puff pastry this time, which worked really fine. Preheat your oven to 220c/425f/Gas mark 7. Unroll the pastry onto a baking tray. Spread with the tomato puree, leaving a 2.5 cm border around all edges. Use a sharp knife to score the pastry just outside the edge of the tomato puree, making sure not to cut all the way through. Glaze the border using the beaten egg. Chuck on the vegetables and the sausage. Finish off with the cheese. Pop it all into the oven. Let it bake for about 20 minutes, until the pastry is risen and as a nice deeply golden colour. This actually started as salmon fishcakes but I gave up on that idea. Why? Well, I had two tins of canned pink salmon that I didn't really know what to do with. 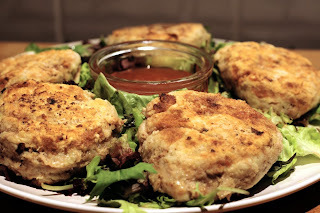 After a bit of thinking I decided to make them into fishcakes. I'd never used canned salmon before so I had no idea just how fiddly it was with all the small bones still there. To make an irritated story short, I canned the can (see what I did there) and went for tuna instead. I still got a can of salmon left if anyone want to come over and pick it up. I sure as hell ain't going to use it. Back to the dish though... You can prepare the potatoes the day before since it's easier if they are really cold. Also, make sure to chill the prepared cakes properly, otherwise they are more likely to fall apart when you handle/fry them. Peel and boil the potatoes as you would if you were preparing mash. Once nice and soft drain them and mash them. Even better is using a ricer. Put the potatoes to the side and let them cool down properly, you can even put them in the fridge over night. When the potatoes have cooled down sufficiently crack one of the eggs into them and mix with the drained and flaked tuna as well as the coriander (cilantro). Season to taste. Make cakes out of the mix and put them on a plate/roasting tray and cover with cling film. Put them into the fridge until nice and cool. Crack the other egg into a deep plate and beat it, put corn flour onto another plate. Dip each cake into the egg and then into the corn flour - making sure to get an even coating. Heat the oil in a frying pan on medium heat and fry until the cakes are nicely golden on all sides. Serve with a crisp salad and a Thai Sweet Chilli sauce to dip in. I just saw a post about this on Guardians blog. It looks like a good idea, you invite people over for dinner and they donate money to this cause as payment for their dinner. I'd probably not be able to ask anyone to pay for a dinner at mine, I'd end up donating the money myself. Still a good and worthy cause. Have a look at their site and see if you can't get some event together. This is about as close to pure comfort food you can come with Swedish food. For me this is the perfect little 'food blanket' that I can wrap myself in. 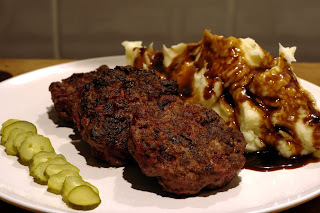 The creaminess of the mash paired with the bite of the onion, ketchup and mustard is just divine. But that's just my opinion, why not cook this yourself to see what you think? I've posted some falukorv recipes before and you can find it in the Swedish food court at IKEA shops worldwide. It's getting late and I'm feeling a bit tired so I won't post any detailed description of how to make the mash. 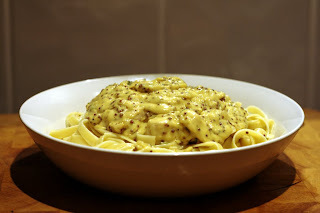 Just make your normal creamy mash and add wholegrain mustard to your own liking. Mix the onions, mustard and ketchup thoroughly in a bowl. While the oven is heating make cuts down about three quarters of the falukorv. Space the slices to about 1 - 2 cm apart. Spread the onion/mustard/ketchup mixture evenly between the slices. If you like, save some to spread on top of the falukorv. Put the falukorv into a buttered ovensafe dish and into the oven once it's heated. Let the falukorv stay in the oven for about 25 - 30 minutes or until it has changed colour to a nice dark brown and the top is crispy. 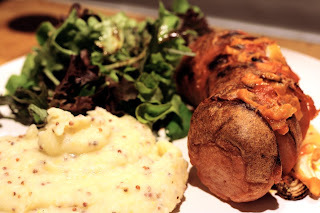 Serve with some creamy mustard mash and a fresh salad. I was watching Saturday Kitchen the other day, well last Saturday to be honest. One of the things they showed was an episode of Rick Stein in Sardinia. 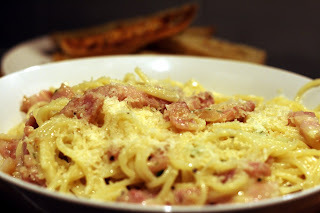 He cooked Carbonara and since I had some lardons at home I thought I'd give it a go too. As you might, or might not, see in the background of the photo there's some garlic bread that I made as well. It's always nice with some garlic bread with your pasta and I had some leftover bread that needed using up. Boil the spaghetti according to the instructions on the package. While the spaghetti is boiling away heat the oil in a frying pan on a medium heat. Once heated, add the lardons and let them fry away. When the lardons start getting some colour, add in the garlic. Let this fry until the lardons start turning a little bit crispy. Put the frying pan to the side. Make sure not to overcook the spaghetti, al dente is good. Drain the spaghetti. Put the frying pan back on the stove on a low heat and mix in the spaghetti with the lardons and the garlic. Add most of the parmesan and give it all a good stir. After that, turn off the heat and stir in the eggs. Keep stirring to make sure that they coat all of the spaghetti. Season to taste, remember that the lardons already have added quite a bit of saltyness to the dish. Finally mix in the chopped parsley. Plate up and add the last of the parmesan to each plate. I guess they'll be reading Eats, Shoots and Leaves in that department at Sainsbury's now. A game of spot the missing apostrophe could be in order. 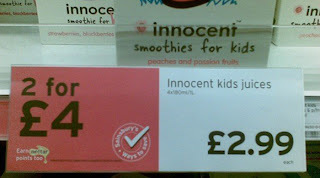 I wonder how they milk these innocent kids for their juices anyway? This is another attempt at cooking some fish to try and vary my diet. Simply pan frying the fish is a very easy way of cooking it and if you season the fish properly it also tastes very nicely. This was the first time I've tried to cook the potatoes for mash in stock. Trust me, this won't be the last time. I shouldn't be banging my own drum too much, but this was probably the best mash I've ever made. Nothing for vampires though, it had one hell of a garlic kick to it. If you wonder what the 'brown blobs' that are circling the plate is, they're button mushrooms that's been fried in butter. Bring the chicken stock to a boil. Add the potatoes and garlic cloves. Let this boil away until soft, 10 - 15 minutes. Drain. Push the potatoes and garlic through a food mill or a potato ricer back into the pan. Season the hake liberally with salt and pepper. Heat the oil in a large non-stick pan on a medium to high heat. Add the hake fillets skin side up. Fry for about a minute and then flip them skin side down. Cook for 6 - 7 minutes more on a medium heat, until the fish flakes easily. While the fish is cooking, heat the milk and cream until it simmers. Slowly stir this into the potato and garlic mixture until it's a smooth puree. Cook very gently for 3 - 5 minutes, making sure to stir the whole time. Beat the butter and parsley into the puree. Season with salt and pepper to taste. Serve the fish on top of the puree. 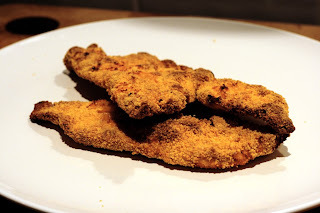 This is a nice way of using Chicken Milanese. 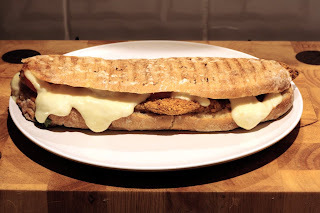 Split your ciabatta in half, put some Marinara sauce on the bottom half. Put two pieces of Chicken Milanese on top of that. Add some sliced tomatoes, top those with sliced buffalo mozzarella. Finish it all off with some salt and pepper on top off the mozzarella. If you got some, add torn fresh basil leaves and then put the top back on to the bread. 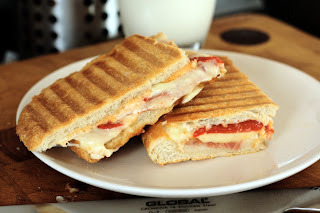 Heat in your sandwich press until the cheese melts nicely. This is a soup that you can chuck together very quickly. Given the recent weather here I thought it could be nice with a warming soup, so this is what I came up with. It's quite a filling soup but serve it with some bread rolls if you're really hungry. I had a thought after I cooked it and I think that it could work quite nicely if you added a bag (or just half of one) of the Taco Spice Mix you can buy in the supermarket. I used some Caribbean Jerk Seasoning to kick my version. Put the potatoes, onions, beef stock and tomatoes into a big pot and bring to the boil. Let this boil for about 10 minutes. Add the hotdogs, pepper, sweetcorn, and the taco spice if you are using them. Bring it back to the boil and let it boil until the potatoes are soft, about 5 - 8 more minutes. Taste as you are cooking away and season to taste. Serve with some parsley as a garnish. I've always been a big fan of beef jerky. Since I got my own dehydrator I'm lucky enough to be able to make my own and I do quite a lot of experiments with different types of spices and marinades. 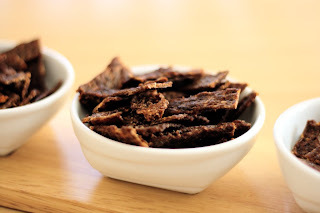 I normally use beef mince to make my jerky, as opposed to thinly sliced beef which is the normal way. Now that I got a Jerky Pistol it's even easier. You just fill the tube with mince, pull the trigger and it pushes out the mince in a neat fashion. This particular batch has been marinated with chili powder and smoked paprika. Added to that was some pineapple chunks that I pulverized with my Bamix. Sounds like a weird combination but it works very nicely indeed. 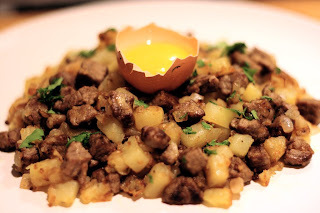 The Swedish name for this hash, pytt-i-panna, means something along the lines of 'put it in the pan'. That pretty much describes this dish. Traditionally you'd use the leftovers from the Sunday roast to cook this dish. Since I didn't have any leftovers I made mine from the ground up. But if you were to have some leftover roast, boiled potatoes and so on you can cook this really quickly. As you can see I had a raw egg yoke with mine, if you don't like the idea of that you can always go for another traditional addition - a fried egg or two. As always, you should avoid raw egg if you are pregnant, elderly and so on. You'll be hard pressed to find someone in Sweden serving Swedish Hash without pickled beetroots on the side, they definitively belong with this dish. I haven't given any measurements etc for this dish since you basically use what you have left over. Generally speaking you can aim for equal amounts of beef and potato with about half the amount of onions. This is a dish that you truly can freestyle to your hearts content, why not slice some chorizo and fry that together with the rest for example? Put the potato cubes in a pan with some salted water. Bring this to the boil and let it boil for about two minutes. Drain and cool the potatoes. Melt a good chunk of butter in a pan. Add the beef and fry until it starts to get some color. Add the onion and keep frying. Once the onion starts to turn soft add the potatoes and more butter if the pan is running a bit dry. Let the mixture fry until it the potatoes gets a nice and golden colour. Taste and season as you cook. Garnish with the parsley, top with the egg and have some pickled beetroot slices on the side. 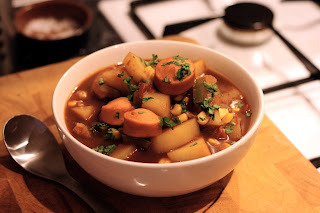 I guess this recipe has quite a German slant to it but you wouldn't have to work too hard to find a dish like this in any of the Nordic countries, or the rest of northern Europe for that sake. I prefer my potato salad to be cold, but you could make it a warm one if you don't like the contrast between the hot sausages and the cold salad. If can get hold of some strong German mustard, go for it. It really works well with the other flavours in this dish. 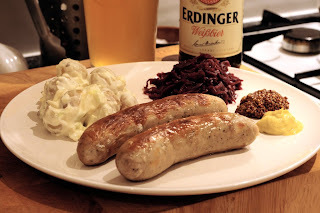 I could only think of one thing to drink with this dish, a cold glass of Erdinger Weißbier. You should be able to hunt a bottle or twelve down quite easily. You can make the potato salad ahead and just take it out of the fridge about 30 - 45 minutes before serving to allow it to get closer to room temperature. If I had any I'd added some sauerkraut to the plate too but this worked quite nicely as it was anyways. Boil the potatoes until tender but not overly soft. Drain and put them to the side and allow them to cool completely. When the potatoes are cool, cut them into half and put into a bowl. Add the spring onions and egg. Spoon in a couple of tablespoons of mayonnaise and give it a good stir. Add more mayonnaise until it has a consistency you like. Season and add lemon juice and tabasco if you want. Refrigerate. Fry, barbecue or put the bockwursts under the grill/broiler until cooked. Serve with the potato salad, cabbage and mustards. This is my collection of cookbooks and cookery related books. Or at least 98% of it or so. And no, I have not cooked at least one recipe from each cook book. This could be a good thing since I got titles like The Original Roadkill Cookbook in the collection. I do admit that I am a cookbook-aholic, I probably keep a couple of traders on Amazon's Marketplace in business just by what I purchase on a regular basis. 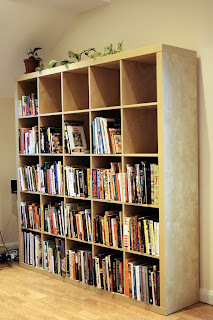 Most of them are serious cookbooks, some specialised and some general. But now and then I can't resists little gems like Star Wars Wookie Cookie Cookbook, The Wiseguy Cookbook or Ruby Ann's Down Home Trailer Park Cookbook. Who could resist titles like that? I figure that I don't cook/eat enough fish. I need to try and change that and this was a good start. 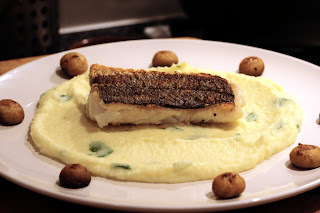 This time I used, sustainable, haddock but you can use other white fish instead. For example pollack, cod or sea bass. If you want to be a bit flash, use lemon infused olive oil and lemon thyme. Heat the oven to 200c. While the oven is warming up, prepare the vegetables. Once prepared put them in a non-stick roasting pan and drizzle over a good amount of olive oil and finish off with a glug of white wine vinegar. Season to taste. Put the roasting pan in the oven. In the meantime prepare the fish. Lightly season the fillet, remembering that the pancetta will add quite a bit of salty flavour to the party. 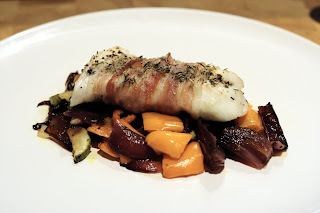 Wrap the fillets with a slice or two of pancetta, trying to get the ends under the fillet. After 15 minutes remove from the oven and toss thoroughly. Add the fish to the pan and return to the oven. Let the fish bake for about 15 minutes or until it is opaque and flakes easily. Serve the fish, garnished with some fresh thyme, on the roasted veg with some boiled new potatoes. Drizzle it all with some of the juices from the pan. As you might have figured out from this blog it's quite common for me and Solo to head to various farmers markets. During our traversals of the countryside in Oxfordshire, Berkshire and so on it's not uncommon to drive past a farm shop or two as well. It's very rare that we can resist stopping, the temptation is too big. You never know what you can find. During one of these stops we noticed something called Organic Cotswold Blue-Veined Brie from the Simon Weaver Cotswold Organic Dairy. Needless to say, a sample was purchased. This sample has been living in my fridge ever since, probably feeling as loved as a ginger step-kid. Since it was getting close to its use-by date I thought long and hard about what to do about it, and this is what I came up with. The Brie? Thoroughly recommended, it was very good. I'll make sure to get more of it as well as trying their other products. Hats off to the Simon Weaver Cotswold Organic Dairy! Start with baking your potato since that will take the longest. While the potato is baking you can make your caramelized onions, which can be quickly reheated just before plating up. Heat some oil in a pan and put in the onion slices with a good glug of balsamic vinegar. Season. Let the onions cook on a low heat for about 25 - 30 minutes or until very soft and caramelized. Season your steak before putting it into a very hot cast-iron pan. Cook to your liking and then let the steak rest for 5 - 10 minutes. While the steak rests, pre-heat your grill to hot. 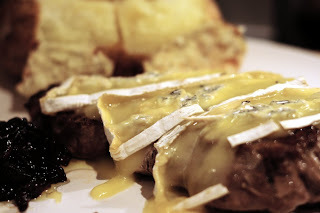 Once rested, put the slices of brie on top of the steak and put it all under the grill until the brie starts to melt. Serve the steak with onions and the baked potato. This Saturday gone the company I work for threw its Summer Party. It was quite a cool event with a British Seaside theme. So there was rain. Lots of it. I had seen the prices for a pint of Guinness so I knew that I had to line my stomach properly if I were to survive the night without getting into too much trouble. 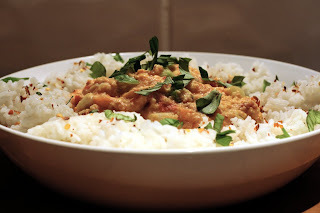 This dish is an old favourite of mine, that can be freestyled in any way you wish. I've had it for breakfast, lunch, dinner and as a midnight snack. I think I created it out of necessity some time long ago in the past and it has been with me ever since. Line a deep plate with the tortilla. Heat the beans with the raw onion and Tabasco until hot. 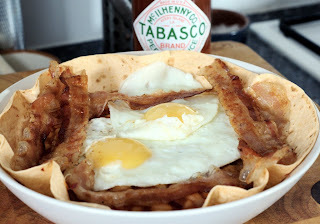 Pour the beans onto the tortilla, top with the bacon and eggs. Finish off with more Tabasco if wanted. 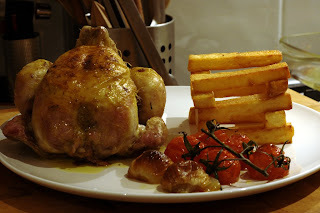 A Poussin is the perfect size for one portion. Instead of buying a whole chicken to roast I get one of these and won't waste anything. The Poussin spends a relatively short time in the oven so the skin might not be as crispy as you'd like it it be. The solution? Use your kitchen blow torch! I served this with some nice twice cooked fries. It takes some extra time to cook them twice but it's well worth it for the extra reward. Heat the oven to 190C/370F/Gas mark 5. Wash and dry the Poussin thoroughly. Give a couple of the garlic cloves a bash with the side of your chefs knife and put them into the cavity of the Poussin. Rub the Poussin's breast with some spices of your choice. Put the poussin in a roasting tray together with the remaining garlic cloves, shallots and tomatoes. Roast the Poussin for about 45 - 50 minutes or until the juices run clear, basting it now and then. Put the Poussin on your plate, together with the tomatoes, shallots and perhaps a garlic clove or two, and dress it with some of the juices from the roasting tray. Serve with twice cooked fries. This was a go at creating something resembling a Reuben sandwich. I don't think I got very close to that, but at least it tasted good. Next time I'll try and get hold of, or bake my own, some proper rye bread too. 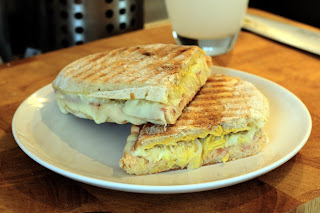 Start by heating the sandwich press/grill. While the press/grill is heating slice the bread in half, lengthwise. Spread the lower half of bread liberally with Thousand Island Dressing. Put pastrami on the lower half, top with cheese and sauerkraut. Finish off the top half of the bread, which should be spread with quite a good layer of hot mustard. When the press/grill is hot enough put in the bread. Be patient and let it be in there until the bread is nicely browned and the cheese have melted. Remove from the press/grill, slice in half crosswise and put the sandwich on a plate. 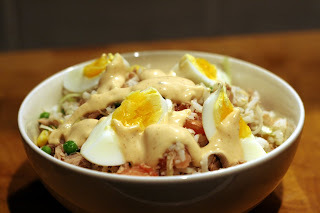 This is an imitation of a tuna and rice salad that my maternal grandmother used to make for me. I don't think I'll ever be able to get my version as good as hers was, but it brings back good memories. 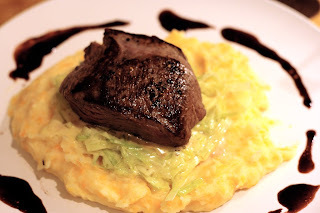 This is another one of these dishes that you can freestyle to your hearts content. You might not like the idea of leek, so use salad onions or why not red onions instead. Add some diced pepper if you like to. Go by your own preferences and stomach, you can't really go wrong that way. If you don't want to play around with creating your own dressing you can just use some store bought stuff. Thousand Island works great with this salad for example. 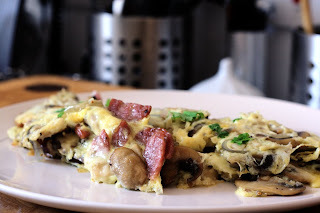 This is one of those dishes that benefits quite a lot from being left in the fridge over night. That way the flavours really gets a chance to mix together and make it taste even better. Mix all of the ingredients for the salad in a big bowl and season to taste. Cover the bowl with some cling film. Put the bowl in the fridge for at least an hour or two so the flavours can mingle a bit. In the meantime make your dressing by mixing the ingredients until you get the flavour and consistency you want. To serve put the salad onto plates, garnish with eggs and apply dressing to taste. 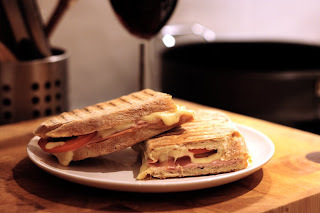 Another go with the sandwich press, this time with some Italian flavours. Spread the lower half of bread with some mayo. Put salami on the lower half, top with roasted peppers and the cheese. Finish off with a couple of basil leaves and the top half of the bread. Quite some time ago I went to a Garden Center with Solo. One of the things we picked up from there was a puny plant of Chenzo chilies. Solo have given the plant love, nurture and water and now it has started to give fruit. Lots and lots of fruit. I've already used a fair few of them in various recipes and you should not be surprised to see them feature in quite a number of my future recipes. 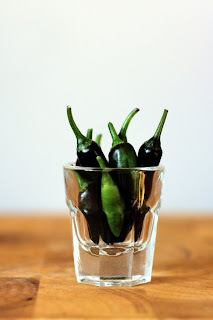 One thing I'm looking at is to chuck a couple of them in my dehydrator to make my own dried chilies. I'll keep you updated as how to that project progresses. Simple can be good. Things don't get much simpler than this when you make a hot sandwich. Spread the lower half of bread with some mayo. Put ham on the lower half, top with the cheese and tomato slices. Finish off with a couple of basil leaves and the top half of the bread. Couscous is another one of these kind of dishes that can be quite boring. However, by adding some spices and such to it you can quite easily make it quite nice and interesting. 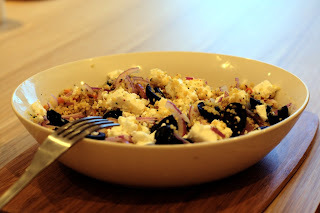 This version is inspired by Greek food, with feta and black olives. You can easily put this into a Tupperware container and bring it to a picnic or why not as a packed lunch for work? As always, freestyle it to your hearts content. This is how I liked it, take this as a starting point and add or subtract ingredient as you want. Make sure that the couscous has been allowed to cool down properly. Stir in the onion, olives, feta and pine nuts. Drizzle with some good quality olive oil.